The highly anticipated California Public Utilities Commission (CPUC) report on the costs of residential solar systems and net energy metering policies was released earlier this month. Net energy metering, or net metering, allows individuals who own solar panels to sell their excess power back to the utilities at a predetermined price. As expected, the report showed just how costly current net metering policies are to the average utility customer. By 2020 net metering in California will cost the state $1.1 billion per year and saddle non-solar utility customers with $359 million dollars of additional costs each year normally covered by solar users. What’s worse is that the brunt of these costs will be borne by low to mid income households while the wealthy continue to profit from unsustainable government subsidies. In fact, the report found that the median income of net metering households is $91,210 compared with the state median of $54,283. National solar advocates fear this report will give impetus to other states such as Arizona, Colorado and Vermont considering further reforms to net metering policies to turn against solar. Net metering has been around since the early 1980s. The idea behind the net metering system is simple—it allows people who generate electricity on their homes and businesses to sell electricity back to the grid when their generation exceeds their usage. At first blush, this seems like a non-controversial proposition. In fact, in 2005 Congress passed the Energy Policy Act of 2005, which mandated net metering be instituted in all states when requested by a state’s residents. When net metering was first instituted, photovoltaic solar systems (PV) and installation were extremely expensive. Rate structures for net metering programs were untested and grid maintenance costs were shared by all utility customers, solar and non-solar alike. Solar panels make up 99 percent of net metering customers in California, and their electricity is generally considered “distributed generation”, or electricity generated away from centralized power stations and closer to the end user. This is usually in the form of solar panels placed on the roofs of homes and businesses. Utilities have invested billions of dollars in developing a reliable grid system for energy transmission and delivery. As rooftop solar systems continue to pop up around the country, they must be integrated into this established network to both send excess solar power into the grid and, more importantly, allow the homeowner to continue receiving reliable electricity from the utility when solar does not meet the needs of the household. These grids must be constantly monitored, managed and maintained to provide reliable energy to all residents and utilities claim that net metering allows solar panel customers to bypass the costs of this grid maintenance. Over the years, the costs of solar power systems have come way down yet the subsidies paid to solar adopters have remained the same. As customers have realized this, there has been a massive spike in solar expansion beyond what most utilities projected and had prepared for. In the last three years alone, the cost of solar panel units has dropped 75 percent, largely due to Chinese production and policies that have driven prices down. This drop in price combined with lucrative subsidies has resulted in a 600 percent increase of installed solar power capacity in the U.S. in the same timeframe. Utilities have issues with net metering because of the rate they pay customers for generating electricity. When a net metering customer generates surplus power and feeds electricity to the grid, the utility is compelled to buy that power at the full retail price. Most of the time this represents an amount much higher than the wholesale prices utilities would pay when purchasing power generated from power plants. The average wholesale electricity price in California for the first half of 2013, for instance, was 4.24 cents/kWh while the retail price was 16.03 cents/kWh. So when utilities in California pay solar customers at full retail, they are paying nearly 400 percent more than they would for energy from other sources. Due to the intermittent nature of solar energy (it only works when it is sunny), solar users will have a need for backup power supplied by their utility. However, when solar owners are subsidized at high rates, and in higher than expected numbers, utilities are paying more than they would otherwise for electricity while still being required to maintain transmission and delivery services for these customers. The CPUC report showed that without reforms to current rate structures and net metering policies, $359 million in costs for utility services and maintenance to the grid will be shifted annually from rooftop solar customers to other ratepayers. Homes that participate in net metering experience huge cost savings by receiving high rates of reimbursement for excess power generation. The California PUC found that utilities were collecting 54 percent above their cost of service (essentially a profit) from current net metering customers before they installed their solar panels. While collecting 54 percent above the costs of providing electricity service for some customers sounds excessive, now the utilities are only collecting 88 percent of the cost of providing electricity service to these same homes. In other words, the utilities are losing 12 percent on average from each net metering customer. This loss gets passed on to remaining utility customers in the form of higher bills. These losses are compounded as the number of net metering customers continues to grow. 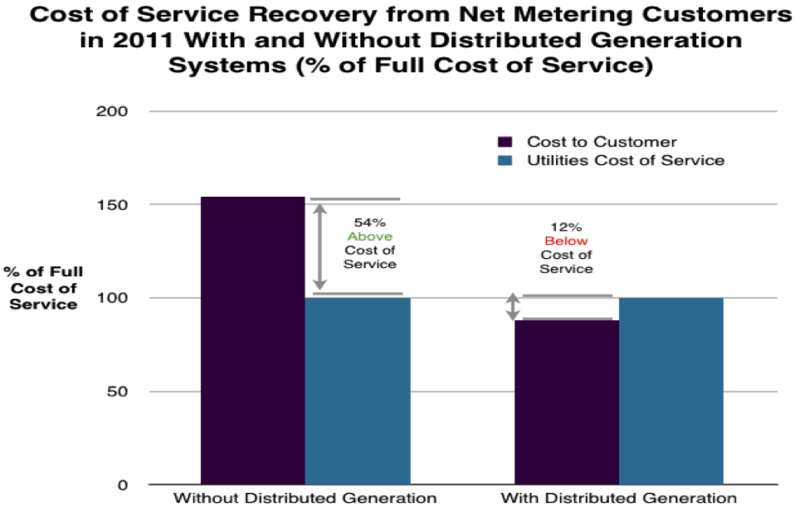 The figure below shows the difference in the recovery of cost of service expenses that utility providers experience from customers before and after installing distributed generation systems. The reason that the California PUC undertook this study is because the Golden State has historically had the most solar-friendly policies in the nation. Its combination of lucrative subsidies, favorable solar conditions and high energy prices have made it a hotbed for solar expansion. Recent concerns with the fairness of net metering when coupled with California’s tiered electricity rate structure have sparked a heated debate at the state capitol. Earlier this year, Democratic Assemblyman Henry Perea from California’s Central Valley region proposed Assembly Bill 327 (AB327) in an effort to reform the states utility rate structure to make it fair to all state residents. 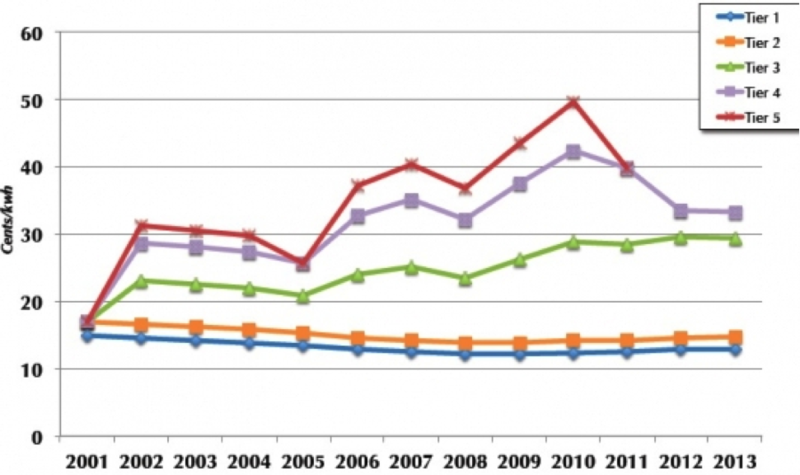 The current system has five tiers of rates that escalated gradually as household electricity usage increased. Perea was concerned that his constituents, many of whom live inland where electricity use is higher than on the more temperate coast, were paying much more for electricity in an effort to cool their homes in the hot desert summers. In fact, those costs were as much as 260 percent higher than lower tier users across the state. While the initial bill did not aim to change the solar industry per se, solar advocates immediately recognized the threat that changes to the utility rate structure would have on their industry. AB327 allowed for two major utility pricing reforms that will have lasting effects on rooftop solar. The first major reform is that the bill allows The California Public Utilities Commission (CPUC) to consider flattening the rate structure and lowering high-end costs that could ultimately lead to lower reimbursement rates for rooftop solar residents. The current system ranges from about 13 cents per kwh for lower tiers to 33 cents per kwh for upper tiers with spikes in past years up to as high as 50 cents per kwh. The current rate structure in California incentivizes high-usage customers to convert to solar because they are paying so much each month. These customers are then reimbursed at the higher rates once their solar panels are in operation. Obviously, reforms to this structure lower the incentive to install solar panels, and affect solar payouts, increasing the time necessary to recoup upfront costs of solar installations. Second, the bill also allows utilities to impose flat monthly fees on utility bills to offset fixed operational costs. The bill sets the cap for these fees at $10 per month. Utilities in other states like Arizona have also called for this use of flat rate fees. The solar industry complains that these fees will cut into the cost benefits for their customers as these costs could not be overridden by net metering payouts. Utilities argue that this would assure at least a minimum level of payment by solar users for fixed costs to the utility such as grid maintenance and transmission. California is the first state to take the step of definitively quantifying the costs of net metering on its residents. With the importance of this report, all parties engaged in the net metering battle around the country have been awaiting the findings. While solar advocates claim that this report fails to account for social and health benefits of increased solar, the message out of California is clear: Net metering is a net drain for electricity customers and utilities. Major reforms are being sought around the country but California and Arizona have garnered extra attention in the net metering battle. These are two large solar states with differing political makeups choosing to tackle these issues head on. With Arizona’s Corporation Commission set to vote on net metering reform next month, the timing of the report will undoubtedly weigh on their overall decision. A study by the Edison Electric Institute (EEI) warned, “The mere fact that we are seeing the beginning of customer disruption and that there is a large universe of companies pursuing this opportunity, highlight the importance of proactive and timely planning to address these challenges early on so that uneconomic disruption does not proceed further.” EEI is also concerned that the disruption caused by non-solar customers subsidizing expanded PV adoption will lead to an unsustainable economic model, which could ultimately hurt the solar industry. While the fight for reforms may evolve into a civil war between utility scale solar and distributed generation rooftop providers, it is obvious that things must change. Distributed generation solar cannot survive long term while dependent on a pricing structure that requires utilities to suffer net losses supporting solar customers and pass those costs onto remaining ratepayers. The CPUC understands that the net metering model in California is not sustainable and must be changed. While the solar industry would love for the unfair net metering payouts to continue indefinitely, the industry may have to accept a new reality in California of rate changes and fixed fees and learn to adapt if it hopes to remain viable in the future.